This use to be a great pub. I was in there the other day whilst xmas shopping and i got really bad service from one of the managers, Danny i think his name is. He looked like he had a bee in his bonnet and couldn't even be bothered to smile. Had a pint and couldnt drink it. tasted as if they had forgotten to clean the pipes for a while! The pub smells really bad too and the quality of the spirits is really unreasonable compared to the price! What once used to be the place to be is now just a lonely unwelcoming mess! Not the best selection of beers although if you know who to ask you can normally get at least one decent handpump. Stopped in here after Christmas party. One handpump but not sure if anything was on. No frills basic pub. 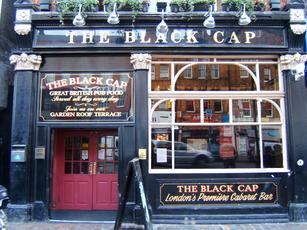 Me and my girlfriend used to love coming to blackcaps to enjoy the food. This was like last year 2009 when the atmosphere was nice and the staff were polite. that was back then. Sadly till this day as of 12/6/10 we rarely go at all. This place has been a dissapointment on several occasions when we have eaten there.. The fish and chips before used to be delicious and the fish was crispy and chunky and great value for the huge portion that you get. Unfortunatly whether it was under the new management or not. the food and service has degraded .. The last time we went i asked the barman for 2 fish and chips..
then my girlfriend noticed that there was 2 options, medium and large..
As the barman noticed i was in the process of possibly upgrading to the large portion, he quickly started to process the order for medium and just said asked for the money..
Then i said can have the large portion instead and he raised his eyeballs, frowned and tutted..
no wonder this pub is going down hill.. somtimes they dont even server food when they are supposed to..
what kind of pub is that? Me and my girlfriend have been put off from coming here because to be hoest the pub is complete crap now!